St. Peter?! But wait, he wasn't a priest...oh, wait. Yeah. He was. He was one of the first priests! 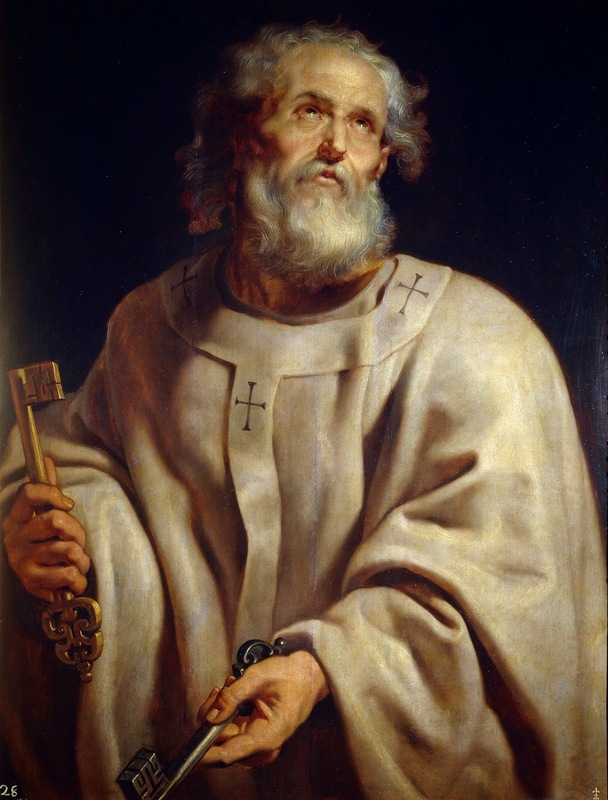 Do you know why I love St. Peter? I love him because he is always and forever sticking his foot in his mouth. I love him because he keeps messing up. I love him because despite all of that, Christ chose him to be the first Pope. 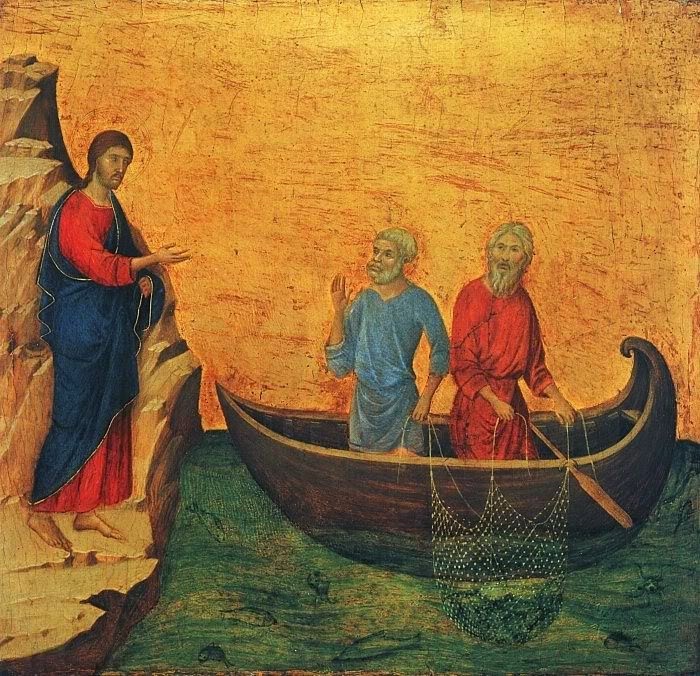 You're probably all familiar with the story of St. Peter - humble fisherman, brother to St. Andrew (also a humble fisherman). Andrew tells him about this Jesus guy and Peter drops everything to follow him. Yada-yada-yada, three years go by and Peter betrays Jesus. Then Jesus dies. Then Jesus rises again. Then Peter and Jesus are reconciled and Jesus makes Peter the first Pope. Then, not too long thereafter, the Holy Spirit comes and Peter is one fire for the faith. Then, eventually, he is martyred. But I really love all the little details that happen in between. I, for one, love Peter's awkward moments. You know, those Gospel readings at Mass when you inwardly cringe for Peter? Recently, we heard the story of the Transfiguration at Mass. 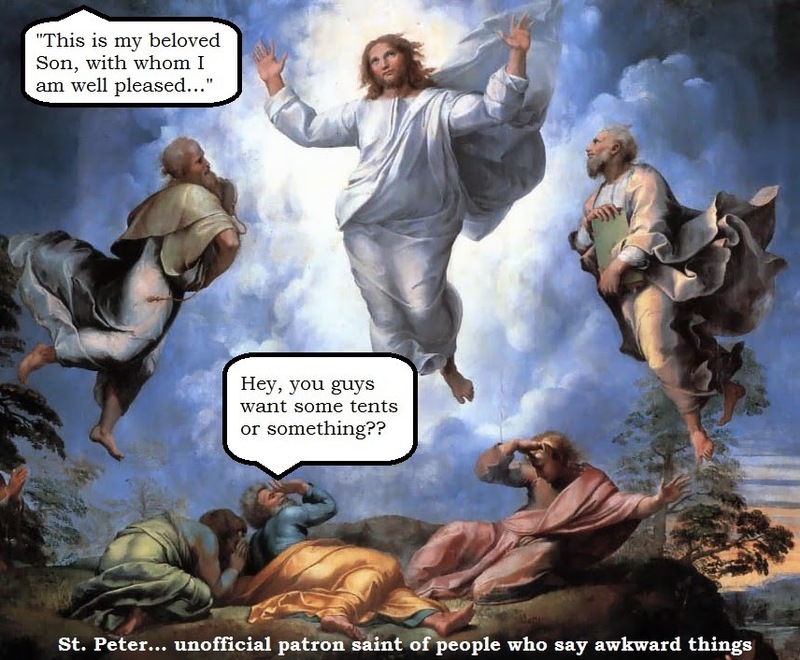 The Transfiguration is one of my personal favorite awkward Peter moments. Jesus is up on the hilltop, Moses and Elijah appear, everyone is shining in radiant light, and James and John are gazing in reverent awe at the whole thing. And what does Peter do? He says something along the lines of, "Oh, hey, Jesus! Thank goodness we're here! We can make you guys each a little tent to sit in." The Gospel tries to explain away his dumb comment by saying that he was so awestruck he didn't know what to say. But come on...can't you picture what James and John are thinking? The eyerolling, the "there's goes Peter saying something embarrassing again." And that isn't the only dumb thing Peter says in the Gospels. But he also is the one who says the least dumb thing in all the Gospels, "Lord, to who else shall we go? We have to come to believe that you are the Christ..."
I don't know about you, but I can really relate to that feeling of "everything I say is dumb." I can relate to feeling awkward. But do you know what I'm not as good at? Boldly saying what needs to be said, without feeling self-conscious. I feel like that's what Peter teaches me. Yes, when you boldly speak your mind, sometimes you'll look dumb. But, sometimes, that means you are the only one brave enough to speak the truth. I think the best part about Peter is that him is his humility. I sometimes worry so much about what people will think of me, that I don't do what needs to be done. But Peter reminds me that it's better to do the right thing, even if you look ridiculous doing it. I think the fact that Christ chose him, of all those wonderful Apostles, to be the one to lead the Church. He chose the one who was imperfect, who said dumb things, who betrayed him. Peter reminds us that if there's hope for him, there's hope for us. God chooses even those of us who are little, and weak, and um...say dumb things!